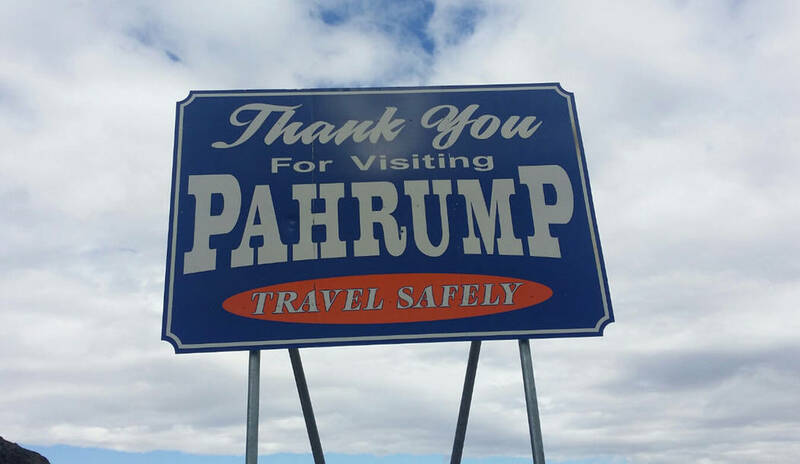 In the town of Pahrump, there are many and varied community-wide needs but which is the greatest? That is just the focus of a new effort by five local nonprofit organizations, which are banding together to determine projects they can collaboratively work on to better the place they all call home. Robin Hebrock/Pahrump Valley Times The Pahrump community needs assessment is being conducted by members of the Pahrump Valley Lions, Elks, Moose, Rotary and Kiwanis clubs. The one-page, three question form is simple, with all fields of input optional and will help the clubs determine projects they can take on together in the future. David Jacobs/Pahrump Valley Times Bill Newyear encouraged all locals to make sure their input is included, as the more assessments are collected, the better. The Pahrump Valley Lions Club, Elks Lodge, Moose Lodge, Kiwanis Club and Rotary Club are organizations with community service at their heart, with each focusing on its own charitable works. However, there is power in numbers and joining forces can help these five different groups have a more profound impact on the community. Pahrump Valley Lions Club member Bill Newyear was excited to announce that these groups have come together and are currently performing a community needs assessment to help figure out what direction they wish to take as a whole in the future. “Several years ago the Rotary, Kiwanis and Lions decided that, working together, we could do a lot more,” Newyear explained of how the proposal came about. Nothing came of that initial discussion but the idea did not die, he detailed. It was revived in recent weeks and the concept is now starting to bear fruit. “Just before the new year this year, the Kiwanis had an end-of-the-year potluck party and they invited other service groups as well. There were representatives for all five involved in this and each got up to tell a little about what they do in the community, nationally and internationally. And it was decided that it would be great if we could all get together and do something,” Newyear stated. Newyear seized the chance to resurrect the concept of collaboration and he immediately invited members of each of the groups to a meeting in mid-January, where it was decided that a needs assessment would be a great first step toward united efforts. Newyear encouraged all locals to make sure their input is included, as the more assessments that are collected, the better. Ideally, he said, the groups would have thousands of questionnaires to review, as this would provide the best picture of what residents believe should be done locally. The groups are currently working to find locations from which the needs assessment forms can be distributed. In the meantime, Newyear said anyone interested in completing the questionnaire can contact him at 661-269-5645 or speak to any member of the Lions, Elks, Moose, Rotary or Kiwanis clubs to obtain a form. 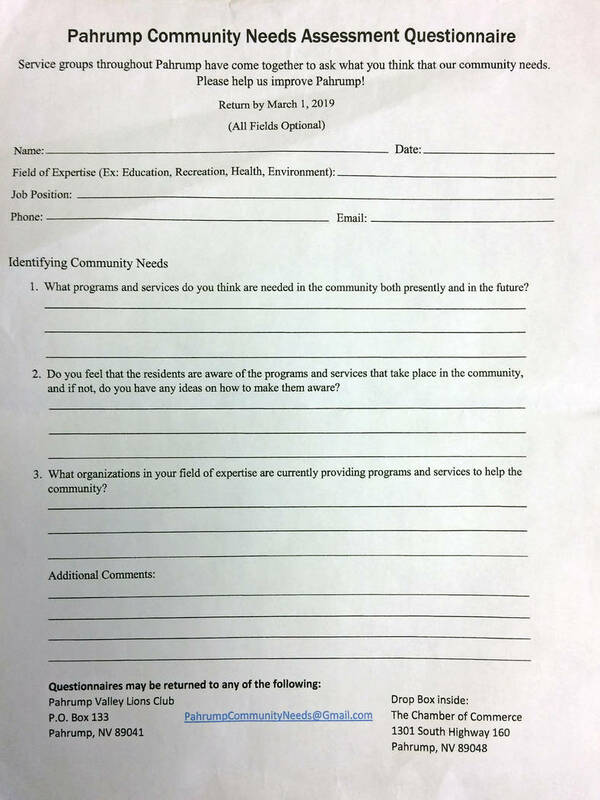 Questionnaires can be returned via email at pahrumpcommunityneeds@gmail.com or via regular mail to Pahrump Valley Lions Club, P.O. Box 133, Pahrump, NV, 89041. Questionnaires can also be dropped off at the Pahrump Valley Chamber of Commerce, 1301 S. Highway 160 in Pahrump.